Wasteland 2 may still be in the early stages of development but the first screen to slip out is pretty awesome anyway. Wasteland 2 isn't expected to be out until late next year and I don't think too many of us will be surprised if that mutates into "sometime in 2014" at some future point, so any screen shot at this point in the process is naturally bound to be extremely preliminary, subject to change and almost worthless in terms of determining what the game will actually be like. But hey, it's the first Wasteland 2 screen shot ever - let's all rubberneck! "Releasing a screen shot this early in the process is a new concept for me as we typically want to hone in every element before we show it. But based on the requests and our desire for fan input, we are doing so to solicit feedback on the basic look," inXile honcho Brian Fargo wrote in the latest Wasteland 2 update. "Please keep in mind that we have not put in the particle effects and post-processing which will have a dramatic effect on the scene, and this represents just one of the various environments for Wasteland 2 so expect to see other quite different locales. Also, this particular camera angle is on the low end of a range that the player can adjust upwards to a much more top-down view, for those who prefer that style during game play." 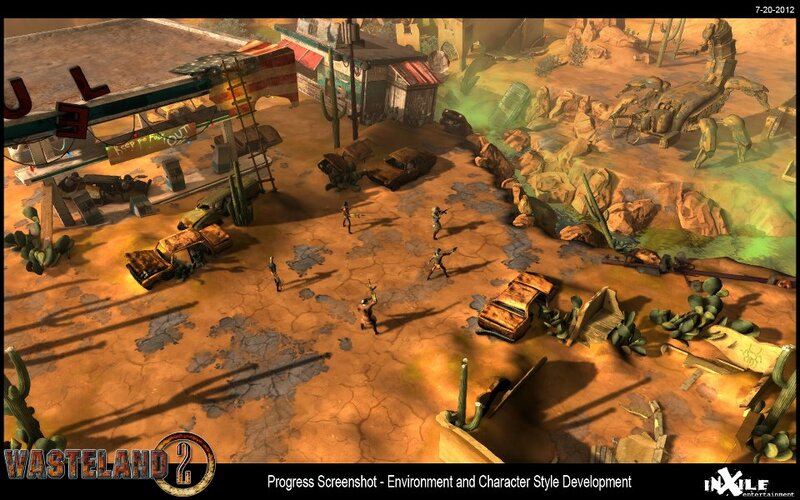 While Wasteland 2 will tell the story of the Desert Rangers, environment art director Koy Vanoteghem explained that after going through a wide variety of games, films and documentaries in search of inspiration, "it became increasingly clear that the modern day conception of a post-apocalyptic world has diversified." Those updated ideas about what a post-end-of-the-world world would look like will be reflected in the game. "Of course, the desert-oriented wasteland devoid of life was still there. But a newer and more compelling version which highlighted nature's reclamation of vacated places took hold of our attention," he wrote. "This new conception gives us the opportunity to generate a variety of environment types while staying true to the narrative. It also allows the location and geology to dictate the flora and fauna, as well as the manner and state of decay. From the dry deserts and icy mountaintops of Arizona to the coastal conditions of LA and larger southern California region, each region generates its own flavor." Since the early part of the game is set in Arizona, the debut screen is nonetheless a desert setting, and although it may not be the most glorious eye candy ever (bearing in mind Fargo's comments about particle effects and post-processing), it's still a real, live Wasteland 2 screen. That's pretty damn exciting all by itself.